Wow, amazing craftsmanship on display here! Great build, lots of details,cool box. Nice work. It has a lot of details in it. I like this a lot! It must have taken quite some time. I think your hinges are one of the better wood ones that have been posted in quite a while. 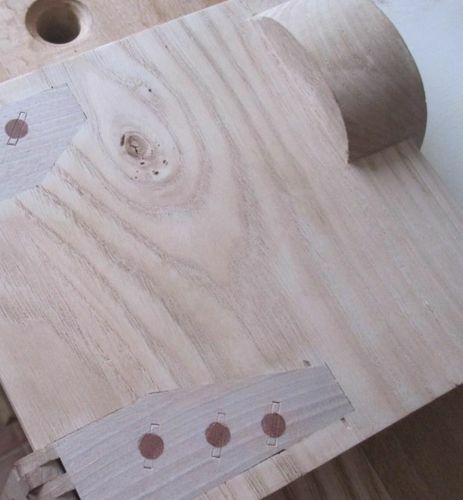 Wedged dowels! That is cool. That’s some really clever design work. Well done! Wowza is correct, what a great build…. Love the details…. Thanks a lot for such positive feedback, I truly appreciate it. YorkshireStewart, when you make everything by hand it can swear it takes longer but the results for me are better. This piece took about 100 hours along two months. SCOTSMAN, everything I do is painstakingly handmade and I mean all of the proccess, from the mill to the final product I use handplanes, backsaws and chisels, that´s the way I teach to the students who come to Aula Flamingo. I have realized I take advantage of the handtools beyond the power tools or machinery and I like to keep the old school. So yes I do, the wedges are made by hand too sir. You can see other of the projects I have posted in lumberjocks and I know you won´t believe every component is prepared and planed by hand, can you imagine a whole workbench built this way ? Thank you for your support. Has anybody watched the video about the secret opening ?